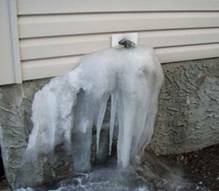 Your sprinkler system needs to be winterized before the cold weather comes to prevent the water inside the system from freezing and cracking the pipes, valves and sprinkler heads. Because the repairs from freeze damage can be very costly, we recommend that you have your system winterized by a irrigation professional. Our appointments for winterizing are made the same way as service and repair appointments. Don’t Let this happen to your Irrigation System!! !